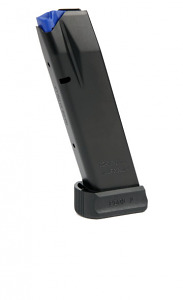 Mec-Gar 19RD magazine for the CZ-75 9mm series pistols. Features a plus 2 adapter increasing capacity to 19 rounds and finished with a special anti-friction type coating. Will not fit Pre-B models. Good quality mags. Super fast shipping from Top Gun! i was pleased how fast the shipping was. although i haven’t tested it yet but the texture and appearance looks quality. Awesome customer service.. very professional. Thanks top gun supply!! And also mec gar is top notch fits my cz perfectly..